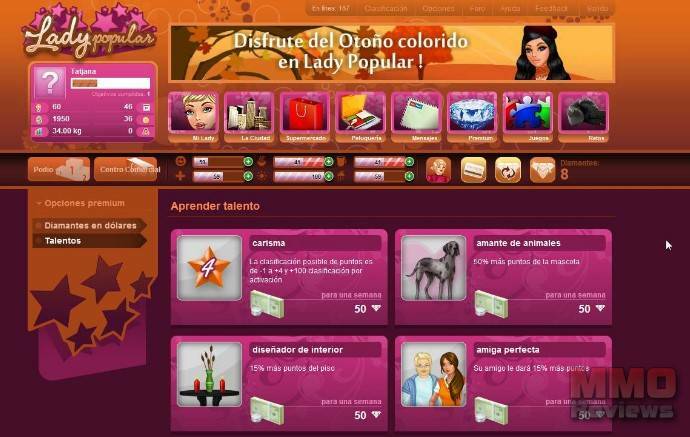 Lady Popular is a free to play online game for internet browsers designed to the female players. The game allows the player to fully customize the look of their own Lady: ifferent faces, make-up, hairstyles, breast size, and of course, thousands of fashion clothes. It offers a virtual equivalent of every modern girl's passion: fashion. It has a very easy to understand graphical interface which leads even non-experienced players fast in the game and its controls. Thousand of shirts, skirts, dresses, shoes, rings, necklaces and much more accessories allow players to customize their virtual Lady in various combinations. More than 16000000 different combinations are possible. Casual clothing, expensive designer clothes or special suits like the Cat Woman, Arabian Nights, Egyptian Queen and many more. Players can visit different places like: The Tattoo shop, to get a cool original Lady Popular tattoo; the Disco, where players can hook-up with other players; The library, Where players can learn new things and upgrade their Lady's IQ; The gym, to keep their Lady in perfect shape; The Mall, where players can enjoy and buy thousands of fashion clothes and accessories. Players layers can also run in the park, get a pet, find a job, have a medical examination, visit the bank, or go back to their apartment and have a nap. As if this is not enough, players can also choose a fancy hairstyle, hair color, lips, or eyebrows for theirr lady. With the advancement in the game players will have the opportunity to visit the best cosmetic studios, enlarge their lips or other parts of the Lady's body. Players can get a cute cat or a large dog and dress it with clothes. Anything is possible and there are thousands of combinations to test with hundreds to be added each month. Finding a rich boyfriend and pursuing a successful carrier allows players to buy their very own apartment or even a villa and decorate it with fancy wallpapers, eastern lamps, persian carpets, or fashion furniture.